I usually don’t start the weekly review with my own stuff, but I worked quite hard on my longer essay on the state of development-there’s even a pdf-download to make it look serious ;)! Development news: Lake Chad crisis; cash project in Lebanon challenges donor practices; rebranding health charities in Canada; Australia’s big aid conference; development & the future of work; financial journeys of refugees; gender, ICT4D & data; we need to be generous in development work. Our digital lives: Design Thinking discovers decades-old participatory development truths; Uber is a big, bad company; can facebook fix journalism? Anthropologist researches check-cashing industry. Publication: An interesting PhD on journalism & journalists in Kenya. Academia: Big Pharma pays big bucks for academic expertise; a history of big data. My post is based on a very fruitful discussion on Jennifer ‘How Matters’ Lentfer’s facebook page that was triggered by Leila Janah’s recent contribution to The Development Set. The discussion addressed many issues I have been mulling over recently-particularly how to break the cycle that even good, impactful development initiatives are caught up in, being servants to consumer capitalism and its manifestations in the second decade of the 21st century. I am aware that I am writing my post from a position of privilege as a full-time academic at a Swedish university. And my final caveat is that this is still ‘just’ a blog post, not a fully referenced academic contribution (although it is about 1700 words long and you can download a nice pdf file if you scroll down). Initially, Stop Labeling Do-Gooders As White Saviorsseemed to be just another a post for my weekly link review. A long week is wrapping up-enjoy some good readings this Friday or over the weekend! Development news: UN rapporteur challenges apolitical organizations; secret securitization of UK aid; Australian NGOs need better gender leadership; the ‘success’ of a failed expensive drone trial; treat people with respect-and they appreciate your information; researching local aid workers in Zambia; Haiti & Nepal’s slow recovery after natural disasters; the world is ‘overheating’; hair & consumerism in Uganda. Academia: The success of open access-IDS Bulletin edition; the rubbish science behind Kahneman’s successful book enterprise; economists need to integrate into society again! 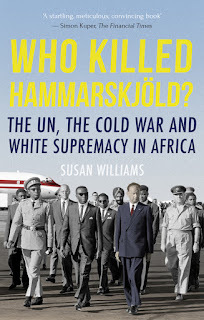 I am not sure that my review needs a ‘spoiler alert’, but after Susan Williams’ research was published in 2011 a new UN inquiry challenged the official verdict of pilot error that led to the crash of UN Secretary-General Dag Hammarskjöld’s plane in 1961, killing him and all fifteen passengers on board. A long week is finally winding down-and there is great content curated for you! Development news:What do we need a World Development Report for? More inconvenient truth for development; how to create prosperity, not just resource-recipients? Does the UN have a culture of (male) impunity? Cheap garments are now made in Myanmar; Beckham denies using UNICEF to boost his image; what is ‘localization’ of aid? The impact of edutainment in India; unusable Nigerians; Who owns Appalachia? Will robots disrupt public sector and aid industry? Our digital lives:Literary festivals in an age of gentrified self-marketing capitalism; Teen Vogue & the emergence of feminist journalists; sexual violence in Canada challenges of big data.